I’m still up to my eyeballs in boxes from our recent move. Will it ever end??? 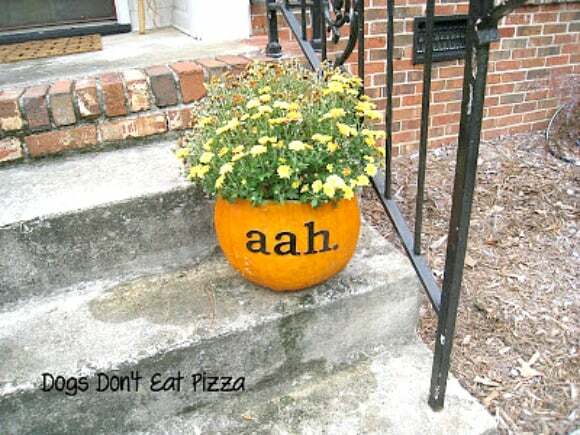 Thankfully, my friend Karen from Dogs Don’t Eat Pizza, is stopping by today to share a great last minute way to add quick fall curb appeal to your home. I love this idea! I am the first to admit that I’m a little slow decorating for fall. As they say, though, better late than never, right? 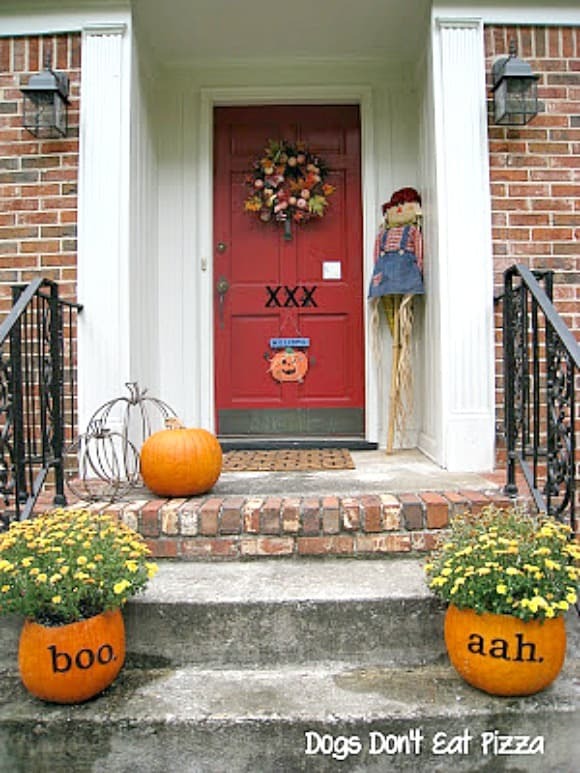 Today I have a great project for adding Halloween curb appeal to your home – it’s quick and can be done last-minute! Then, scoop out the pumpkin innards (seeds and pulp). I also cut around the sides of the pumpkin to narrow the sides (see how knife is positioned, above), so that the plant could easily fit in it. 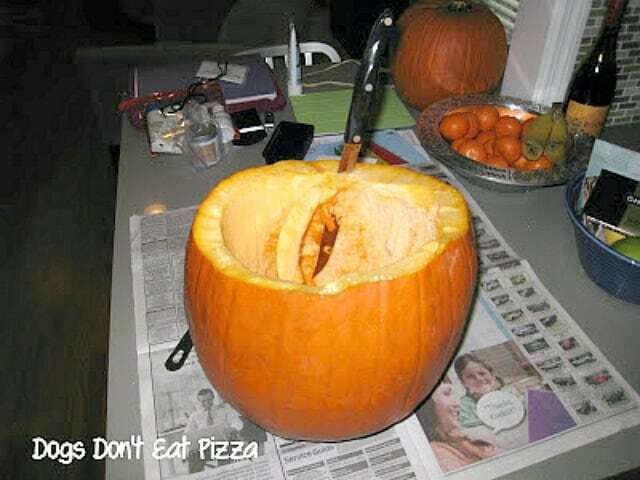 Be careful not to let your knife go through the sides or bottom of the pumpkin. 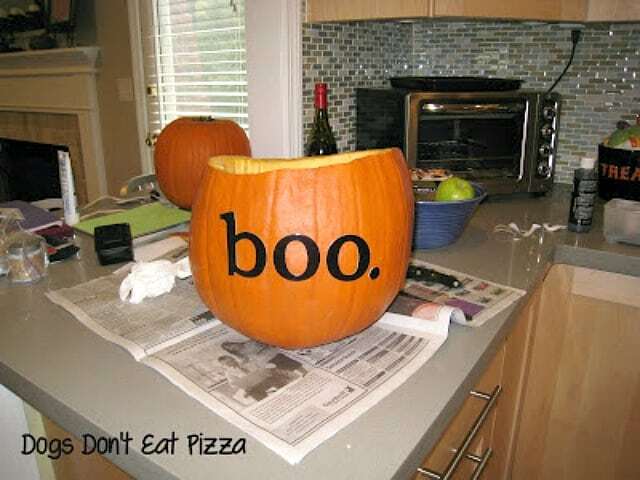 Then, I wanted to add some letters to the pumpkin. I thought about using paint, but I had these great adhesive letters that were the right size and font, so I used those. Also, I’ll explain in a bit why paint might not be the best option here; adhesive, removable letters was what I used. 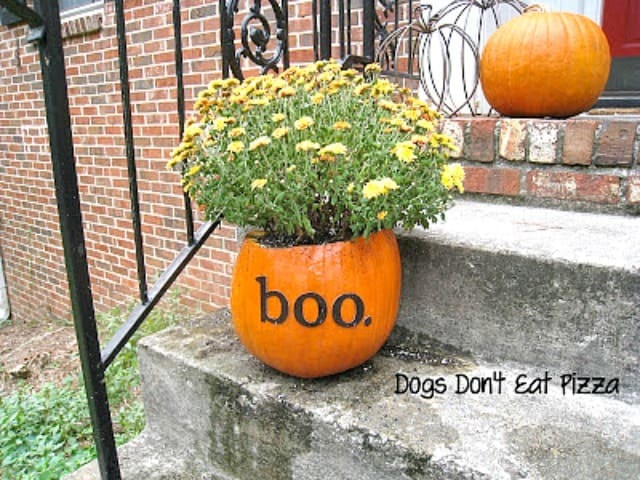 (1) If you don’t already have planters, this is a festive and inexpensive alternative. The pumpkins were a little more than $4.00 each (local pumpkins at Whole Foods, 3 for $13) and I had the letters and extra potting soil already. Thanks to Suzy for letting me stop by today! Thank you for sharing this great idea with us, Karen. I’m going to give this one a try! You’ll want to be sure to go visit Karen. Dogs Don’t Eat Pizza is chock full of DIY, upcycling and repurposing projects and all sorts of fun! The planters are so cute! I’ll have to try it. I agree, Joanne! I think the words that she added make them even cuter.